Most drones you see flying about are cool, but think about the fiendishly brilliant possibilities of a drone that's slim enough to fly virtually anywhere — like the palm-sized Extreme Micro Drone 2.0 – which for Jalopnik readers is 46% off. Besides the potential for office high jinks, the advantages of such a small drone are fairly obvious — it can easily be stuffed into your bag, and you don't need an open sky to fly it safely. 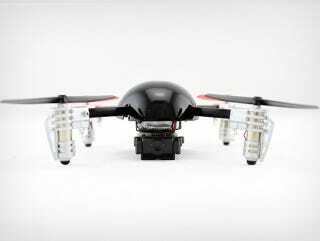 Despite weighing just over an ounce, it has a mounted camera (a first on a quadcopter of this size) which can take photos and video, and in flight, it has a range of 400 feet. It is also self-stabilizing, which should help newbie pilots. Right now, the Micro Drone 2.0 has 46% off, bringing the price down to $74.99, which includes free international shipping. Check out the link to grab the deal, or scroll down to see the Drone in action.